Children 2 to 3 years. Ages listed to start or move on to the next classroom are estimated, and placement is based on availability and development, always what is best for your child first and foremost. 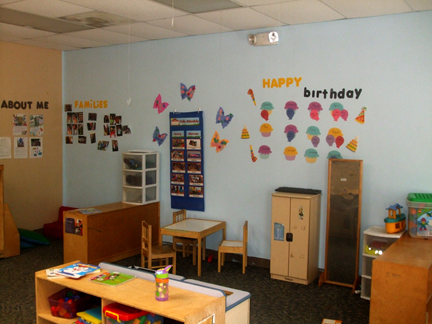 This classroom each child is learning potty training in a shared restroom with other preschoolers. The toilet, sink, paper towels are at their height level. This classroom has a changing table. This age group does not need to be potty trained to be in this classroom. To advance to the 3 or 4 year old classrooms they need to be potty trained. Living Springs Preschool is a Christian Preschool accredited by the NAEYC(National Association for the Education of Young Childhood), we also have an ABC Quality rating of A+. For detailed information on all Living Springs Licensing and Accreditation. Full day hours are 7:15 AM to 6:00 PM. Monday to Friday. Child to teacher ratio is 6 children to 1 teacher. Max in Backyard Buddies classroom is 2 teachers to 12 children. Our Teachers work with the children on strengthening verbal skills through repetitive songs and books. We help teach early problem solving and social skills. activities like eating, and using the restroom. Twos still learn through “mimicking”. In these classrooms children learn to do things themselves through everyday activities. 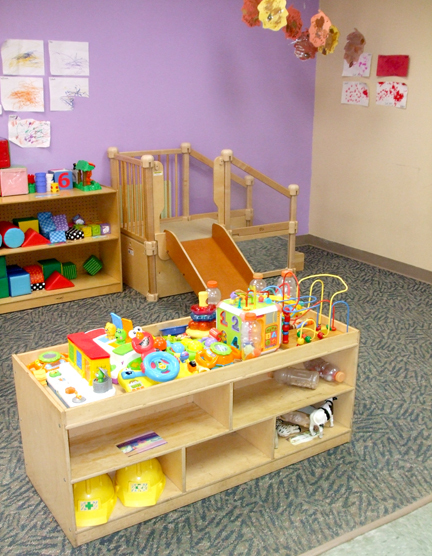 Children learn from their “natural” surroundings, with a home living center, and lots of tactile experiences. Teachers share daily information with parents verbally, and Daily Sheet. Parents may also connect with Living Springs Preschool & ASC (lslcps) this link. We follow primary care giving guidelines. This helps each child form special bonds and assures that all needs are being met consistently each and everyday. lslcps has an open door policy, this means we encourage our parents to visit any time they like. Washing hands is a big deal at lslcps. It helps combat germs, and minimize the chances of your child getting sick. Everyone washes their hands when entering the classroom. Parents help their child wash their hands upon arrival, and before placing items in the refrigerator, or cubbies. Teachers assist all children with washing hands before snack, lunch, and any other time needed through out the day. The lslcps goal is for children in twos classrooms to get three hours of outside playtime a day (weather permitting). Once a week the children attend Chapel with lots of singing. The children learn about God’s grace and love. Parents get a handout each week about the Bible verse they talked about in Chapel. All these items require a doctor’s authorization, and form signed by the parent. Pediatricians offices fill these forms out often. One will be given to you from LSLC CDC staff for your convenience. 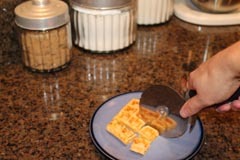 for cutting small pieces for busy parents. Lunchtime is between 11:30 a.m. and 12:00 p.m. Children eat in the classroom.